Like the fabled 18th century militiamen, our NRA Minuteman Concealment Mantel Clock performs its everyday job without attracting attention. Also like our revolutionary heroes, its outward appearance conceals an underlying, defensive capability. At first glance, it’s a finely crafted, furniture-grade timepiece that boasts a custom designed, golden NRA clock face with a reliable quartz movement. Only you will know its secret: open the magnetically latched, hinged front panel to reveal a felt-lined interior compartment that’s perfectly proportioned to contain a medium to large handgun (up to 8” L x 5” H). Constructed of solid wood with a rich mahogany stain. Size: 14 5/8”W x 7 3/8”H x 3¾”D. Requires one AA battery (not included). Imported. Lost use of mechanism that drives the clock after six months. Kept it for the looks and gun storage but now I want the time keeping element as well which is why I'm purchasing again. I purchased this clock a few years back and haven’t had any issues. It still works and nothing has broke. My only complaint is the NRA logo or markings in obvious spots on most of their items. 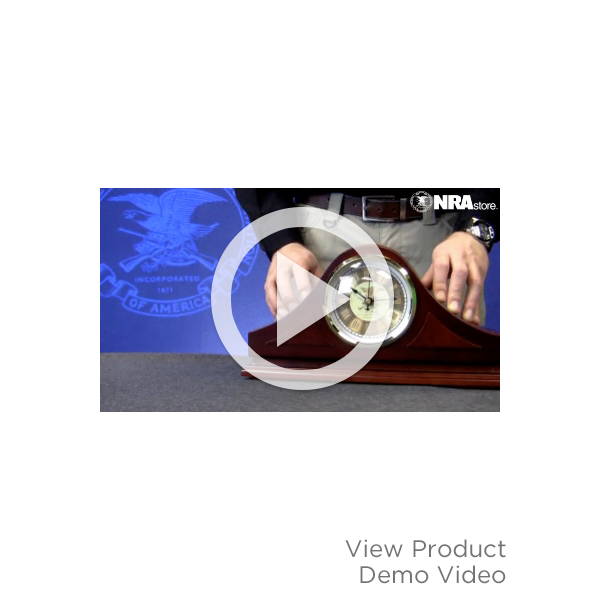 The idea behind the clock is to hide a firearm with easy access but I feel like the logo in the center of the clock is a dead giveaway that it’s potentially housing a weapon. Clock lost 2 hrs. on day 1, changed battery, working fine so far. Fit and finish is really nice. THIS IS A GREAT PRODUCT. EXTREMELY GOOD QUALITY AND VERY DECORATIVE. AS ALWAYS, NRA STORE SELLS GREAT QUALITY ITEMS.